James F. Nejedlik, 94, passed away peacefully on Monday, May 7, 2018. Jim was born in Cleveland, OH, on January 6, 1924, to the late James F. Nejedlik and Marie Tous Nejedlik. Beloved husband of Betty M. (Komora) for 67 years and devoted father to Denise (deceased), Jeffrey, James (Jan), & David (Karen). Jim was also the proud grandfather of Michael (Laura), Adam (Jessie), Olivia, & Isabelle, and great-grandfather to Jaxon, Irelyn, Haley, & Alexa. He was predeceased by siblings Milton Nejedlik & Nadina DelTorto. Jim grew up near his father's real estate company on Union Avenue in Cleveland, speaking only Czech when he began kindergarten and having to bring his schoolwork home to be translated. He graduated from John Adams High School in 1942, from Case Institute of Technology in 1945, and later earned a Masters degree in Metallurgical Engineering. 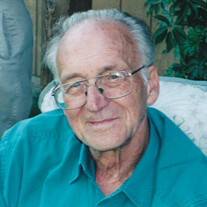 Over the course of his professional career with companies including TRW and Bailey Controls, Jim was granted several patents for his research developments. He was a valued employee, known to be generous with his time, often explaining his theories and testing procedures to educate follow lab employees. For several years, he served as a judge for the Solon Schools Science Fair competition, which he enjoyed immensely. Jim spent 30 years serving as a docent at the Cleveland Museum of Natural History, and if you were lucky enough to ever have him as a tour guide, you were bound to leave amazed at his volume of knowledge and his enthusiasm for the subject matter. In 1975, Jim moved his family from Lyndhurst to Aurora Shores in Reminderville, OH, to pursue his love of sailing. He built a Mirror 16 sailboat in the garage, which he captained in weekly regattas for pleasure until he was almost 90 years old. During his retirement, Jim stayed active by taking tap dancing classes and perfecting his talent as a watercolorist, producing several award-winning landscapes. Jim was an avid reader, often sharing his love of Czech history. He was also a true dog lover and will be dearly missed by all who knew him. In lieu of flowers, the family would appreciate donations in Jim's name to the Cleveland Museum of Natural History, 1 Wade Oval Dr., Cleveland, OH 44106. Private family services.